Includes a Bible story, discussion questions, activities, snack ideas, games, and more! Share this exclusive download with your friends, family, teachers, and kids leaders FOR FREE! Valentine’s Day is coming up! Use these fun and easy crafts and activities to show kids how to actively love those around them—not just on Feb. 14 but all year long! This free eChart is just 8 activities out of the 65 activities from Jesus’ Disciples Instant Bible Lessons. 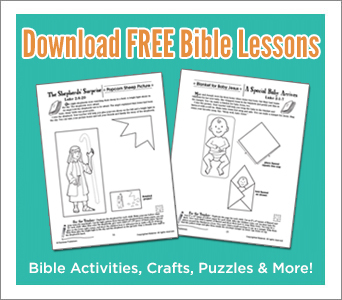 Each full lesson includes a Bible story, key memory verse, and even more activity options! Who were the men closest to Jesus? These Instant Bible Lessons take you inside Jesus’ “inner circle” to learn more about Jesus’ devoted followers, their backgrounds, their strengths and weaknesses, their purpose, and their mission. Find out more about each disciple’s unique personality, his encounters with Jesus, and the lessons we can learn from those who knew Jesus best while He was on earth. Packed with over 65 quick-prep activities, crafts, and puzzles, this reproducible lesson book shows kids how to follow Jesus in a practical way. As they hear about Peter, John, Thomas, James, and other disciples— kids will also learn about obedience, witnessing, sharing God’s love, using their gifts, and more. Kids will quickly learn their memory verses and apply the lesson to their lives with dozens of hands-on activities. 8 Related Activities: Puzzles, Crafts, Skit Ideas, Games and More! Don’t Wait! Save $5 For 5 Days Only! Save 35% on Jesus’ Disciples Instant Bible Lesson Book— Just $8.99 (Reg. $13.99). Order it today and save $5.Offer good while supplies last.